Homemade baked corn tortilla chips is a recipe you are going to make again and again! 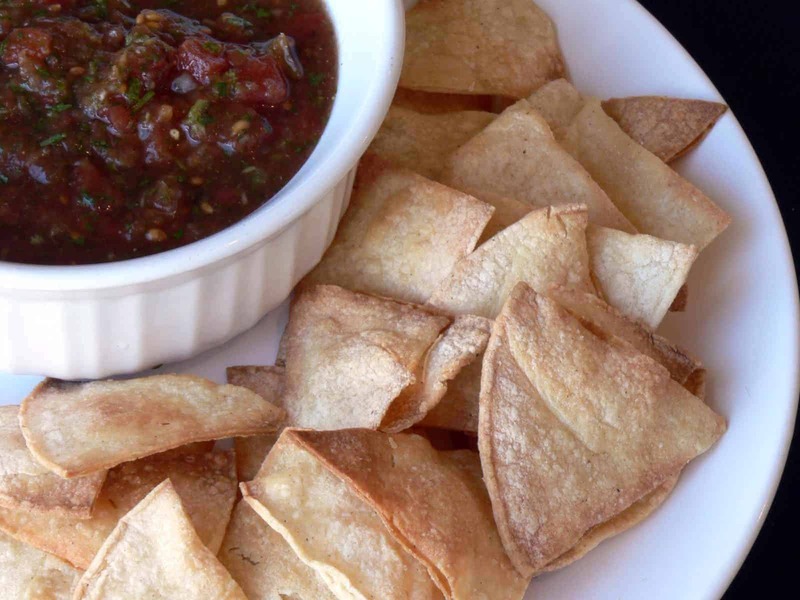 One of the best parts of eating at a Mexican restaurant is the warm chips and salsa while you wait for the entree. These chips are just what you’re wanting and more! 3 ingredients and 20 minutes is all you need. They are easy and healthy (baked, not fried) and I promise they won’t disappoint. 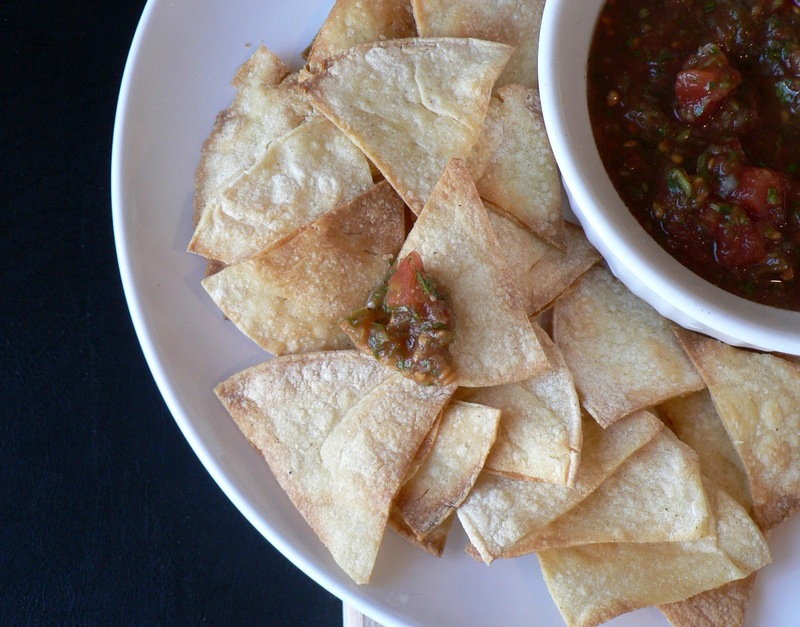 We love tortilla chips; we eat them all the time. I make my kids bean dip for lunch 2 or 3 times a week and they love plain chips for a snack. They were asking for some one day and I didn’t have any, so we made them. They turned out so well that I made them 2 more times that week and I haven’t bought a bag of tortilla chips yet. They are best warm and make you think you are eating at a Mexican restaurant. Preheat the oven to 400 degrees and line a baking sheet with parchment paper (not totally necessary, but it makes it easy to clean up). Place a tortilla on your cutting board and brush it with olive oil. You don’t have to go crazy and drench it, but be sure to get a good coat of oil over the entire tortilla. Sprinkle with salt. Flip the tortilla over and brush the other side with oil and then salt. Using a pizza cutter, cut the tortilla into 6 or 8 pieces (like you are cutting a pizza). Place the tortilla pieces on the parchment lined baking sheet and repeat until your pan is full. Bake for 10-15 minutes until the chips start to brown on the edges. Salt again when you take the hot chips from the oven. Allow the chips to cool for a few minutes and then serve. The chips will get crispier as they cool. And in case you missed it, these are amazing with this salsa. You are so sweet Melissa 🙂 Thank you so much! I’m definitely making these tomorrow! I love your blog. You seriously have the best recipes… those homemade oreos were amazing. Visitor from Katie’s site 🙂 Just wondering if you have ever tried to store these and did they stay crisp or are they better to make right before you eat? They look amazing! Thanks! Brush with butter and top with a sprinkling of cinnamon and sugar (or honey) for a delicious dessert. What are the best kind of clean corn tortillas are used? The bigger health food store in the town we shop in sell fresh corn tortillas that say organic non-GMO… perk of living near the Arizona boarder- great authentic Mexican food. Do you have access to anything like that? I’d even look in a Mexican market! Wow….these are now his favorite chips! I opened up the bag of Tostitos, made your blender salsa and tried a batch of these for the fun of it……..The Tostitos slunk back into the pantry, untouched….had to make another pan of these to fuel his appetite! Actually slightly overcooked the first batch….it happened so fast! Then I over-salted them(not always a bad thing! )(I do love salt!) The second batch was perfect at 8 minutes. I think he is starting to like the food experiments! Muchas Gracias!!! !